Luke: Here, cousin. It looks like you could use a swig of this. It's good for what ails you. Orville: Sufferin' sassafras! My rudder's on fire! Bail out! Bail out! Madame Medusa: [phone rings, Medusa comes in] Who could be ringing at this time of night? Madame Medusa: Madame Medusa's Pawn Shop Boutique. Madame Medusa: Snoops! Don't tell me, Snoops, let me guess! You found it! Ha ha! You've found the diamond! Madame Medusa: Give you time? You bungler! You have been down there for three months! Madame Medusa: Bottles? What - Bottles? You caught Penny sending messages in bottles! You blundering fool, can't you control a little girl? Shut up! I am taking the next flight down to Devil's Bayou! Penny: [the swampmobile won't start] Oh, please start. Bernard: Not the horn, the spark lever. Digger, hold this. Bernard: It's that doohickey on the steering wheel. Penny: [praying] Please bless Rufus, and Teddy... And all the kids at the orphanage: Jennifer, Bobby, Mary, Julie. And please let someone find my bottle. There's a message in it. Because running away isn't working. Amen. Penny: Oh, here. I brought you something. Rufus the Cat: Grand notion! Cat-nip snaps. Penny: [giggles] No, they're ginger snaps. Rufus the Cat: Well, an old codger like me could use a little ginger. Penny: I taked two extra ones for lunch today. We're not s'posed to do that. Rufus the Cat: You can trust me. I won't tattletale on you. Penny: I love you, Rufus. Bianca: Oh, look! The little girl's treasures! Bernard: Boy, the things kids collect. Bianca: Oh, come on. You worry too much. You know that flights are always late. Bianca: Now, what did I tell you? We're lucky, Mr. Bernard. Bernard: Luck? Flight 13? Maybe we'd better take the train. Orville: [Through radio] Wake up! Dab-drat it, somebody answer down there! Get off the dime! Hello? Hello? Is anybody down there? Orville: [Through radio] Where the tuck have you been? Oh, you lazy knucklehead. Bianca: Uh, oh, what did he say, Mr. Bernard? Bernard: I wouldn't dare repeat it. Bianca: Well, then give him the permission to land. Bernard: Uh, Captain? You, uh, you have our permission to land. Orville: Well, it's about time, bud! Bianca: Poor Evinrude. Your carburetor is all pooped out. Bernard: [about the seat belts] Miss Bianca, make sure it's fastened good and tight. Bianca: I can't. It'll wrinkle my dress. Madame Medusa: Brutus! Nero, stop that infernal racket. I mean NOW! Madame Medusa: [screams and jumps on a chair] Ah! Snoops! Snoops, a mouse! Oh, kill it! Kill it! Rufus the Cat: Now, look here, you two. If anyone found out that mice have moved in, I'd get kicked out, lose my job. Bianca: Oh, don't worry, Mr. Cat, we- we won't be here long. Rufus the Cat: [while stretching his legs] Wh- I- I'm too old to be chasing mice. Madame Medusa: At the next low tide I'm going to put her down there, myself, and keep her there, until she finds it. And it is as simple as that! Penny: [working out a plan to trap the crocodiles, Nero and Brutus] See there? The elevator. Bianca: Oh, it's a perfect cage, Penny. Bernard: Great idea. Now, uh, what - what can we use for bait? Penny: Oh, they'll eat anything. Penny: [doing an impression of Medusa] Brutus! Nero! Did you let that little brat escape again? You're too soft. Bernard: [chuckles] Hey, Penny, that's not bad. Bianca: [laughs] That's exactly like Medusa. Penny: [walks like Medusa and imitates her again] Track her down, boys. Bring her back. Penny: [as she starts to sniffle, then cry] Don't worry, teddy, we'll-we'll be... alright. Bernard: [planning to trap the alligators] Now, uh, what can we use for bait? Bernard: How 'bout trying the 3 blocks down and 4 blocks over? Miss Bianca: What did you do to make him so mad? Bernard: Nothing. He's just a grumpy old lion. Miss Bianca: Well, after all, waking him up in the middle of the night. Wouldn't you be grumpy, too? Bernard: Sir, could you tell us what happened to a little girl named Penny? Rufus: I sure can. But you ain't gonna find her 'round here. See, poor little thing ran away. Rufus: [after telling Bernard and Miss Bianca about when he last saw Penny] She seemed happy enough, but the next thing I heard, Penny was gone. Bernard: Well, aren't the police still looking for her? Rufus: No. They gave up weeks ago. Miss Bianca: This is terrible. That poor little girl. Bernard: I just can't believe that Penny would run away. Mr. Rufus, please think. There must be something else. Rufus: Well, come to think of it, there was. [pauses] No. No. It's nothing. Penny wouldn't get in with her. Bernard: Get in what? With who? Rufus: A weird lady tried to give Penny a ride, but she wouldn't have anything to do with trashy people like them. Miss Bianca: Trashy people? Who? Rufus: She and her partner run a sleazy pawn shop down the street. Bernard: Miss Bianca, we must go down there and investigate. Rufus: Suit yourself. But you'd be wasting your time goin' down there. Bernard: She could be in real trouble. We gotta find her and help her. Rufus: [laughs a bit] Yeah. But, two little mice. What can you do? Bianca: Well, why don't we take the shortcut through the zoo? Bernard: I don't know... I mean it... could be risky. Bianca: Oh, come on. Remember our pledge? "Through storm and rain and dark of night - "
Bernard: [Climbing the steps to board Orville] ... eleven, twelve... Oh no. There... there are thirteen steps on this ramp. Bianca: [chuckles] Why don't you jump the last one? Bernard: [as he, Bianca, Penny, and the swamp denizens escape successfully from the riverboat via the swamp mobile] We did it, Bianca! Bianca: Hooray! Oh, Bernard, Bernard, you're wonderful! Madame Medusa: [lamenting, as she is left clinging to one of the riverboat's smokestacks] There... goes... my diamond! Bernard: [planning an escape] Wait a minute. She-she might catch us in her swamp mobile. TV Announcer: And because of a courageous little girl named Penny, the world's largest diamond, the Devil's Eye, is now at the Smithsonian Institute. But what's even more important, folks, this little orphan's dream has come true. Today, she's being adopted. And here she is with her new mother and father. Penny: We - Hi. Where'd you come from? Bernard: We found the bottle with-with your message, and we've come to rescue you. Penny: Didn't you bring somebody big with you? Like the police? Bernard: Uh, no. There's just, uh - the two of us. Penny: That's what Rufus said: "Faith makes things turn out right." Bianca: Oh, that poor little girl. Oh, Mr. Chairman, can I please have this assignment? Mr. Chairman: You? Miss Bianca? Why, this is unprecedented. I mean, It's not like it was in the old days, when it was a man's world. But, I guess there's a first time for everything. Penny: That's where the water comes in. Oooh, I'm afraid to go over there. Bernard: Well, if I were a pirate, that's just where I'd hide the Devil's Eye. Eh, I'll go over and- check it out. Bernard: come to think of it, If I was a pirate, I wouldn't, I wouldn't hide anything back there. Orville: Say, bud, read the checklist to me. Bernard: Uh, oh, yeah. "Goggles down." Orville: [shaking tail] Double check. Bernard: "If at first you don't succeed, try, try again." Orville: And here we go! Bernard: It's - It's no use, Bianca. Maybe Rufus the cat was right. Wh-what can two little mice do? Bianca: But, Bernard, the Society's counting on us. We can't quit now. Oh, and that little girl. We just have to rescue her. Madame Medusa: [Pointing gun at Mr. Snoops and Penny] Shut up, Snoops! And don't move. If either of you try to follow me, you'll get BLASTED! Penny: [walking towards Madame Medusa] You give me my teddy bear. You promised. Orville: Why don't you watch where you're going? Ellie Mae: Are you ready to help rescue that little young 'un? Deadeye: Sure enough, Ellie Mae! Ellie Mae: [Notices Luke fast asleep] Luke! On your feet, you lazy critter! Luke: Oh, uh- Shucks, Ellie Mae. I was just a-waitin' for someone to holler charge! Gramps: Dag nab it! Let's cut out the jawin' and get it goin'. Deadeye: [Chuckling] When old Gramps gets head up his nose gets plum out of joint. Ellie Mae: Take it easy, Gramps! We gotta stay here 'til Evinrude brings us word from the mice. Gramps: If that bug don't get here soon, they'll put that poor little girl down the black hole again! Bianca: What did you do to make him so mad? Bernard: Nothing, he's just a... just a grumpy old lion. Bianca: Well, after all, waking him up in the middle of the night. Wouldn't you be grumpy too? Bianca: [watching Orville fly] Doesn't he fly beautifully? And you wanted to take the train, you fraidy cat. Bernard: [gasp] Pull up, pull up! Snoops: All right, you little brat. Now, you are gonna go down in that hole, and you are gonna dig till you find me the diamond. You understand that? And no sassing me. Snoops: Bring her right on in, boys. Come on. Snoops: So, you tried to run away. Ah, well, it didn't work, did it? Huh? Penny: The water's coming in. Please pull me up! Madame Medusa: Not until you get the diamond! Madame Medusa: You get down there and find the big diamond, or you will never see the teddy a - gain! Bernard: Are... Are- are you hurt, sir? Orville: Nope. One of my better landings, bud. Madame Medusa: Snoops! Snoops, get down here! Snoops: W-W-What's up, Medusa? W-What's going on? Madame Medusa: Snoops! What's wrong? Mr. Chairman: "To Morningside Orphanage, New York." Hmm. Most difficult to decipher. I can't make it out. Bianca: "I am... In a terrible... terrible trouble." Oh. Oh, dear. It's all watered out. "H-h-hurry! Help! Penny." Mr. Chairman: Penny? Morningside Orphanage? Huh! Dash it all, it's not much to go on, is it? Bianca: Oh! Oh, that poor little girl. Bernard: We gotta find her, and help her. Rufus the Cat: Yeah, but two little mice! Wha - what can you do? Bianca: Captain you fly beautifully. It's just like being on a roller scooter. Bernard: He just went through a red light. Bianca: I do that all the time, darling. Now come on, stop worrying. Rufus the Cat: What's wrong, Penny, honey? Rufus the Cat: Come on now, come on. No secrets. You tell old Rufus, huh? Penny: Well, it was adoption day at the orphanage. Rufus the Cat: Well... what happened? Penny: A man and lady came and looked at me, but they choosed a little red-headed girl. She was prettier than me. Rufus the Cat: Aw, sh-sh-she couldn't be! You listen to me, darling. You're something extra-special. Rufus the Cat: Why, some day a mama and a papa will come to the orphanage looking for a pretty lil' girl, just like you. Rufus the Cat: I'll bet my whiskers on it. Madame Medusa: [Holding the Devil's Eye] Just look at it! Filled with power, for its owner! Snoops: Let me look at it. Snoops: I got... Hey, that wasn't much of a look. Madame Medusa: [Madame Medusa calls Penny into her bedroom] Come in! Come in! Penny: [Penny walks in holding her teddy bear] Did you wanna see me, ma'am? Madame Medusa: Why, yes, my dear. Don't be so shy. Madame Medusa: Now, I'm going to let bygones be bygones. Do you know what would make Auntie Medusa very happy? Penny: Yes, you want me to find that diamond. Madame Medusa: That's right, dear. Penny: But I've tried as hard as I could. Honest! Madame Medusa: Of course, you have. But we must try harder, mustn't we? Penny: Then, please, will you take me back to the orphanage... like you promised? Madame Medusa: Penny, don't you like it here? A big, beautiful boat all to yourself. Penny: But if I don't get back to the orphanage... I'll never get adopted. Madame Medusa: Adopted? What makes you think anyone would want a homely little girl like you? TV Announcer: Penny, you were a brave little girl to do what you did all by yourself. Penny: Oh, I didn't do it all by myself. Two little mice, from the Rescue Aid Society, helped me. TV Announcer: Mice? 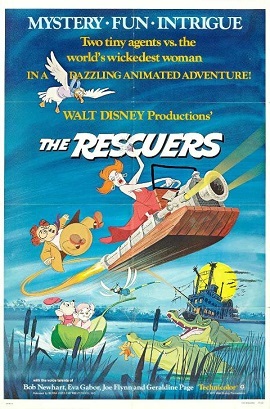 Rescue Aid Society? Penny: Yes! They rescued me. Penny: Um, could I say hello to them? Penny: Hello, Bianca! Hi, Bernard! TV Announcer: You can - talk to these little mice? Penny: All the time. Mice can talk like anybody. Didn't you know that? TV Announcer: [as the watching R.A.S. laughs] Well... I didn't. But I do now, Penny. Madame Medusa: High tide or not... that little brat is going to find me that diamond... tomorrow... or else! Bernard: Are you- Are you all right, dear? Bianca: Why, she- she tried to kill us. That, that, that terrible woman! Oh, if I was only a ten-foot mouse, I'd show her. Madame Medusa: Now my dear, you're going to find the big shiny, diamond for your Auntie Medusa, aren't you...? Bernard: Sure wish we'd taken the train! Rufus the Cat: Faith is a bluebird, we see from far. It's for real and as sure as the first evening star, you can't touch it, or buy it, or wrap it up tight, but it's there just the same, making things turn out right. Penny: Can't touch it, or buy it, or wrap it up tight, but it's there just the same, making things turn out right. But whoever adopts me has to adopt Teddy, too. Rufus the Cat: Oh, they'll love him! He doesn't eat much, does he?